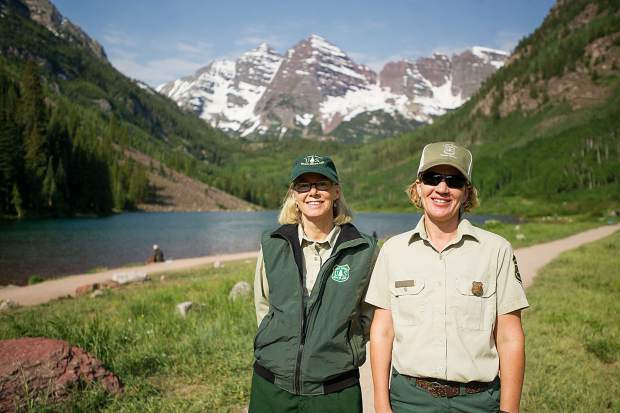 Aspen-Sopris District Ranger Karen Schroyer (left) and recreation manager Shelly Grail check out the Maroon Bells Scenic Area Wednesday. They help oversee U.S. Forest Service operations there. One recent, spectacular morning saw families with small children hiking around Maroon Lake, students from a water-coloring paint class perched along the shore, a drone flitting (though not permitted) over the placid waters and groups of young adults from Aspen Ideas Fest taking a guided nature tour. In short, it was a typical day in the national park-quality setting 10 miles southwest of Aspen. A record 300,000 people soaked in the spectacular sights of the Maroon Bells Scenic Area last summer, according to a U.S. Forest Service estimate. Agency officials expect the record to be eclipsed this year — possibly depending on the quality of leaf-peeping season. 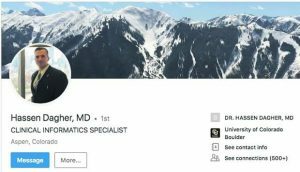 The White River National Forest is implementing a plan to limit overnight visits to the adjacent Maroon Bells-Snowmass Wilderness (see related story on page A10), but officials say they haven’t reached capacity at Maroon Lake itself. 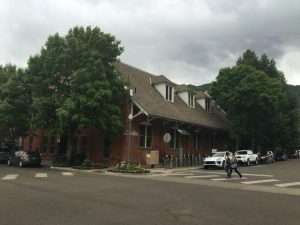 Her bigger concern is safely transporting visitors to the site — without swamping neighborhoods in the lower Maroon Valley with traffic and parked cars. Aspen, Pitkin County and the Forest Service were ahead of their time by prohibiting most vehicles and requiring visitors to use public buses starting in 1978. Cars vastly outnumbered the parking spaces, so vegetation was getting trampled and idling vehicles were polluting the high-valley air. Personal vehicles are limited between the hours of 8 a.m. and 5 p.m. Vehicles that travel up Maroon Valley before and after the restrictions are required to pay $10 per vehicle. The bus trip is $8 for adults and $6 for seniors and children. The Roaring Fork Transportation Authority handles the heavy lifting. It hauled a record 199,768 passengers to Maroon Lake last year, an increase of 5.78 percent from the prior summer. “RFTA — it’s a well-oiled machine,” said Shelly Grail, recreation manager for the Aspen-Sopris Ranger District. Bus drivers play a key role in educating visitors about the unique environment — and their responsibility for staying on the paths and keeping a safe distance from moose, black bears and other wildlife. In the short ride from Aspen Highlands, the bus drivers can interact longer with visitors than forest rangers and volunteers. “The passengers are captivated for 30 minutes,” Grail said. Most of the 300,000 visits to the scenic area are crammed between June 1 and mid-September. The number of leaf peepers in the fall is even greater than the number of hikers and sightseers during midsummer weekends. To handle the hordes, the Forest Service has a staff of nine employees, four of whom are stationed at the Bells from 7 a.m. to 7 p.m. any given day. The Forest Conservancy provides volunteers who greet visitors getting off the buses. 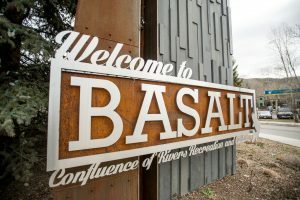 Aspen Center for Environmental Studies guides lead nature hikes. It’s a team effort. Grail said the ecosystem is largely intact and undamaged despite the heavy use. The shoreline and adjacent paths are trampled wider than many conservationists would prefer, but in the big picture the environment around Maroon Lake remains in good shape, she said. The Maroon Bells Scenic Area is the biggest dose of nature that many visitors will get. Visitors runs the gamut from hard-core backpackers who handle the grueling Four Pass Loop to the greater number of people who step off a bus and don’t venture past Maroon Lake, she said. “It’s such a spectacular place, you can understand why people from all over the world are attracted,” Grail said.